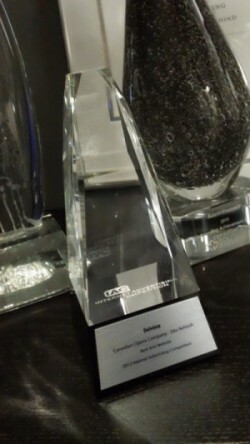 Our new IAC Award just arrived this afternoon and we wanted to share it with you! Our redesign of the Canadian Opera Company website won the award for Best Arts Website in the 2012 Internet Advertising Competition (IAC) Awards, presented by the Web Marketing Association. The website, at coc.ca, which Delvinia originally redesigned in January 2009, underwent a creative refresh in March 2011 and has since won six international awards, including an Interactive Media Award, a Stevie Award, a WebAward, a W³ Award and a Davey Award. The website was refreshed to include a new homepage with a prominent link to purchase tickets and online subscriptions as well as tabs directing visitors to information about upcoming operas, the blog, and what’s happening behind the scenes. The site also integrates more content-rich imagery, designed to match the confidence of the new brand while illustrating the essence of operatic theatre. For more information about Delvinia’s work with the COC, please visit the Work section of our site.